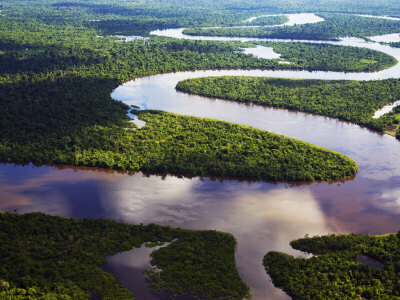 The Amazon River is about 6.400 kilometres long, and is considered the second longest river of the world. Depending on how the length is measured, it can compete for being the longest, but the Nile is generally accepted as being longer. On the other hand, the Amazon River is undisputedly the river with the largest water flow. It originates from the Ucayali-Apurimac river system in the Peruvian Andes Mountains, and flows through Colombia and Brazil before it reaches the Atlantic Ocean. At the widest part, the river is 10 kilometres across. During the wet season, though, the widest part can be as wide as 48 kilometres. The biodiversity of the river basin is incredible. It has more then 2100 different species of fish, and the number is growing as more are discovered. It also has a huge diversity in mammals, including the boto, or Amazon River Dolpin, which is the largest of the river dolphin species. Another famous inhabitant is the anaconda, one of the world's largest snakes.